Break a 200g bar Waitrose Belgian Milk Chocolate into a small pan, add a 142ml pot double cream and 50g butter and heat gently, stirring until melted and well blended. Roughly chop ½ x 100g pack Waitrose Roasted Salted Pecan Nuts and place them in a large bowl with a 75g pack Waitrose Raisins & Berries. Whizz 2 Continental Classics Brioche Rolls in a food processor, to form crumbs. Add to the bowl, then stir in the melted chocolate. Pour into a 500g non-stick loaf tin and leave to cool. Chill overnight. Briefly dip the tin in hot water, then turn it upside down and tap sharply to release the cake. 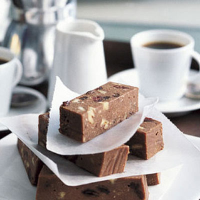 Cut into bars and serve with aromatic Waitrose Kenya AA Coffee. serve with aromatic Waitrose Kenya AA Coffee.